In the spring of 2018, Made in Britain held a workshop in Manchester where members got together to share ideas, stories and business cards. The host of the workshop was MIB member Axion and they are in the recycling business. Cars and electrical appliances go in one gate at Axion and raw materials come out of the other. We don’t know any other organisation that recycles machinery so efficiently. Axion’s ‘products’ are metals and plastics and by using the most technologically advanced (and secret) processes, thousands of tonnes of metal and plastic start a second life when they leave Axion. One of the delegates at the Manchester workshop was a manufacturer called David Trotter. David doesn’t actually have a factory. He’s a dynamic, versatile manufacturer who uses the power of networks to achieve his goals by working with other manufacturers who make his stuff in their factories. One of David’s most successful inventions is the muggi tray – a drinks carrier designed to make the overloaded and precarious tray obsolete. 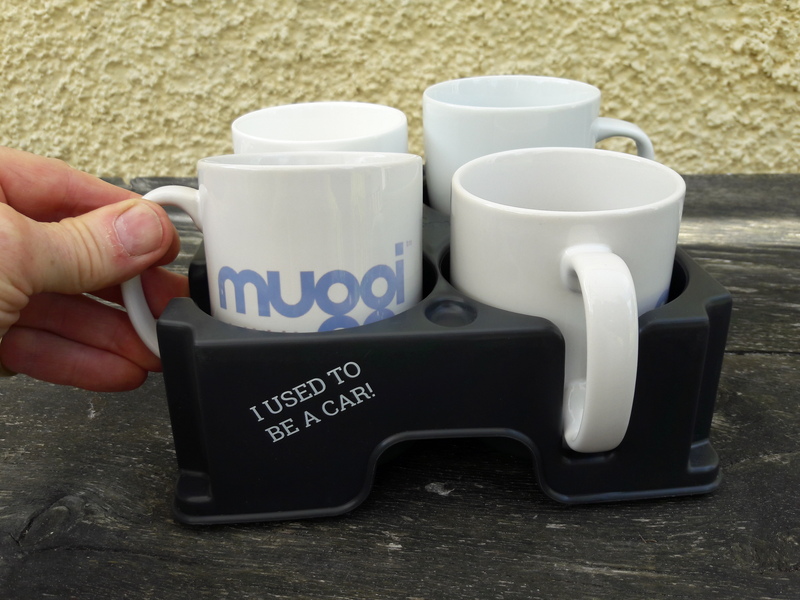 The muggi is rugged and stable and is catching on big time with campers, boaters, caravanners, as well as the ubiquitous apprentice and office junior. The muggi tray is also very popular now in the disability market, proving to be a real aid for people with tremors or wheelchair users, and has just delivered a first order into a NHS hospital. Muggi transforms the banal, mundane and potentially dangerous drinks run into a safe and stylish adventure. Anyway, David makes his muggi tray out of polypropylene material – plastic. You can guess where this story is going, can’t you? OK, fast-forward a bit then. Although muggi needs fresh, virgin plastic for their bright, vibrant colours, there’s now a smart dark grey version that’s made out of 100 per cent recycled plastic, plastic that David Trotter is in the process of considering sourcing from Axion. David is a great example of how, by engaging with the Made in Britain network, new opportunities arise. He told us "I've attended two previous MIB workshops and find the networking extremely stimulating and useful to hear other members stories. Muggi has been and will continue to be a regular contributor to the workshop goody bags! "I found the MIB workshop at Axion particularly interesting because we at muggi have been looking to create a fully recycled materials version of the tray! 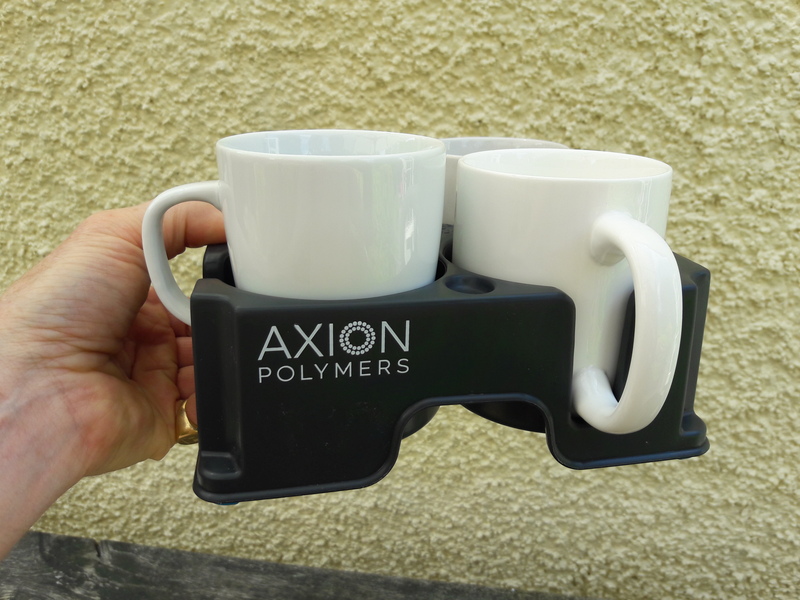 Following our factory tour we discussed the possibility of using some of the recycled Polypropylene material to create a promotional item for Axion Polymers; this we did and we are now considering sourcing our dark grey PP from Axion going forward. We are also in the process of looking to use recycled waste paper coffee cups to produce reusable multi-use coffee cup trays"
David is delighted at the amount of interest being shown in his environmentally friendly muggi tray and the power of the Made in Britain network, its exciting times ahead for muggi and we cant wait to hear more as things progress for David. Come along to a Made in Britain Workshop and receive a FREE muggi tray in our goody bag.